Aloof standing in the mountains above the magic palace, where the ancient gods reside in the "Sky Arena"; according to the annals of historical record, it bears an extraordinary magic with his army swept through the whole continent, but in the palace there were imprisoned many conquerors of powerful soul, never again to gaze on the light of day. After bidding farewell to the ancient gods, their smiles lost long ago, this continent, "where people try to challenge me! If you are able to match the strength of courage, then I will give you glory." 1. Players with Sky Arena recommended cards in their Deck will receive bonus Fame. The higher you place in the Fame rankings, the greater the rewards that await you! 2. During the event, certain cards recommended by the Sky Arena will gain the ability to grant Bonus Fame. The use of such Creatures in your Deck will increase the Fame you receive from a match. The use of multiple recommended Creatures in a Deck will greatly boost the amount of Fame you receive from a match. 3. Based on their abilities, players will be able select from the 3 different gates, Mortal, Elite and Heroic. The stronger the opponent, the more Fame to gain from a match! Players can utilize their Gems to draw upon recommended cards from the Altar. Hot Tip: During the Sky Arena event, all players can collect and enhance creatures that are found on the list above. 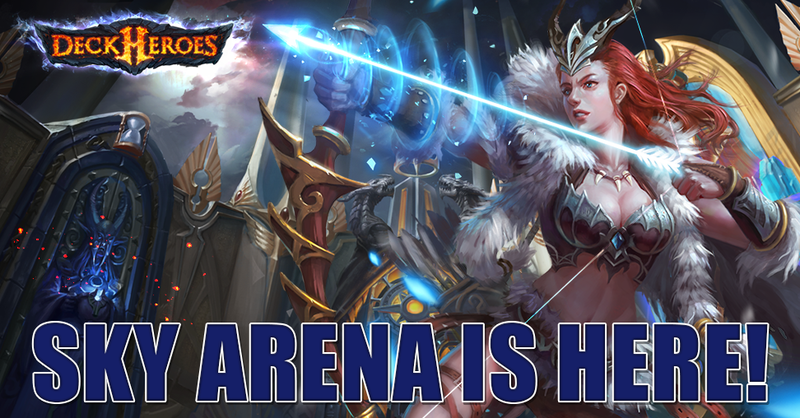 During May 11th 0:00-May 17 23:59(GMT-5), the Sky Arena's doors will be wide open! Players need to choose the toughest gate that they can enter and successfully clear in order to earn the highest amount of Fame! 2. Reach the required amount of Fame to claim the orresponding rewards. 4. Your Fame will reset at the end of the event so please ensure you claim your rewards before then. Note that the rewards for the Sky Arena are not fixed and will be subject to change in between events. The TOP 2,000 players will receive different rewards, with only the rewards for the top 100 players shown here. Note: Please update to Version 5.0.0 the latest content. Quero jogar esse sky arena.